In a race dominated early by Matt Kenseth and later by fellow title contenders Jimmie Johnson and Dale Earnhardt Jr., Jamie McMurray got to the front at the right time, led the last 15 laps and grabbed victory in Sunday’s Camping World RV Sales 500 at Talladega Superspeedway. McMurray was out front, leading Earnhardt in the sixth Chase for the NASCAR Sprint Cup race of the season, when a slight tap from Ricky Stenhouse Jr.’s Ford sent Austin Dillon’s Chevrolet spinning into the outside wall on the backstretch. Impact from Casey Mears’ Ford launched Dillon’s car into the air and severely damaged both machines. The resulting third caution of the race froze the running order with McMurray in front for his first victory of the season (and first since 2010), Earnhardt second and Stenhouse a career-best third. For the second time in as many weeks, a non-Chase driver went to Victory Lane in a Chase race, the first time non-Chasers have won consecutive Chase races since Tony Stewart won back-to-back at Atlanta and Texas in 2006. That McMurray won at Talladega for the second time in his career, however, should come as no surprise at all. 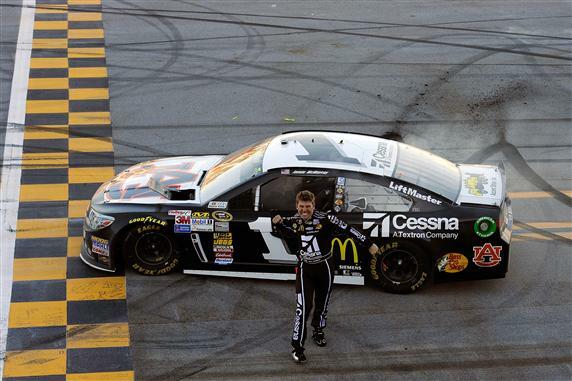 Four of McMurray’s seven career wins have come at restrictor-plate tracks. In the last 20 laps, the field spread out single-file in the top lane, and in fact, McMurray — with his Cessna-sponsored No. 1 Chevrolet adorned in Auburn University colors — had surged into the lead from the outside on Lap 174, moving up the track in front of Stenhouse and Earnhardt as the outside line began to move. “At the plate tracks, to get the right line, it requires a lot of risk, and I felt like I was pretty patient all day, and I saw the 17 (Stenhouse) and the 88 (Earnhardt) coming on the top,” McMurray said. “It just seemed the top was the better place to get hung out than if you got hung out on the bottom. Fortunately, I was able to get myself in position. Paul Menard came home fourth, followed by Kyle Busch. David Ragan, the winner at Talladega in May, ran sixth. David Gilliland, Martin Truex Jr., Ryan Newman and Clint Bowyer completed the top 10. Jimmie Johnson finished 13th, despite leading a race-high 47 of 188 laps, but took over the series lead from Matt Kenseth, who fought an ill-handling car during the second half of the race and finished 20th after dodging the last-lap wreck. Johnson leads Kenseth, who led 32 laps, by four points with four races left in the Chase. The last-lap move Earnhardt was planning never materialized, thanks to the caution for Dillon’s wreck. Earnhardt, however, said he didn’t want to risk getting shuffled back through the field by making his move too early. 1. (9) Jamie McMurray, Chevrolet, 188, $236345. 2. (8) Dale Earnhardt Jr., Chevrolet, 188, $180210. 3. (21) Ricky Stenhouse Jr. #, Ford, 188, $187596. 4. (34) Paul Menard, Chevrolet, 188, $154726. 5. (27) Kyle Busch, Toyota, 188, $162068. 6. (7) David Ragan, Ford, 188, $133618. 7. (24) David Gilliland, Ford, 188, $122293. 8. (4) Martin Truex Jr., Toyota, 188, $128235. 9. (17) Ryan Newman, Chevrolet, 188, $128493. 10. (20) Clint Bowyer, Toyota, 188, $132793. 11. (6) Greg Biffle, Ford, 188, $106710. 12. (33) Kevin Harvick, Chevrolet, 188, $134071. 13. (11) Jimmie Johnson, Chevrolet, 188, $140346. 14. (19) Jeff Gordon, Chevrolet, 188, $131671. 15. (36) Michael McDowell, Ford, 188, $90310. 16. (18) Joey Logano, Ford, 188, $115343. 17. (5) Carl Edwards, Ford, 188, $121660. 18. (30) Kurt Busch, Chevrolet, 188, $113030. 19. (38) Travis Kvapil, Toyota, 188, $108468. 20. (12) Matt Kenseth, Toyota, 188, $122076. 21. (2) Jeff Burton, Chevrolet, 188, $98460. 22. (1) Aric Almirola, Ford, 188, $122046. 23. (26) Trevor Bayne(i), Ford, 188, $84735. 24. (35) Justin Allgaier(i), Chevrolet, 188, $104018. 25. (39) Dave Blaney, Chevrolet, 188, $94057. 26. (16) Austin Dillon(i), Chevrolet, Accident, 187, $127535. 27. (10) Casey Mears, Ford, Accident, 187, $96510. 28. (37) JJ Yeley, Chevrolet, 187, $83360. 29. (13) Brad Keselowski, Ford, 187, $133651. 30. (14) Josh Wise(i), Ford, 187, $84035. 31. (31) Cole Whitt(i), Toyota, 187, $79880. 32. (22) Michael Waltrip, Toyota, 187, $87660. 33. (23) Danica Patrick #, Chevrolet, 187, $79510. 34. (29) Bobby Labonte, Toyota, 187, $87310. 35. (40) Terry Labonte, Ford, 187, $79135. 36. (28) Kasey Kahne, Chevrolet, 186, $96980. 37. (43) Landon Cassill(i), Chevrolet, 183, $78846. 38. (15) Denny Hamlin, Toyota, Engine, 142, $93625. 39. (3) Marcos Ambrose, Ford, 134, $97039. 40. (25) David Reutimann, Toyota, Engine, 119, $65825. 41. (32) Juan Pablo Montoya, Chevrolet, Accident, 78, $89039. 42. (42) Joe Nemechek(i), Toyota, Engine, 60, $57825. 43. (41) Tony Raines(i), Chevrolet, Engine, 2, $54325. Average Speed of Race Winner: 178.795 mph. Time of Race: 2 Hrs, 47 Mins, 49 Secs. Margin of Victory: Caution. Caution Flags: 3 for 10 laps. Lap Leaders: A. Almirola 1; J. Burton 2; A. Almirola 3-7; J. Burton 8-10; M. Kenseth 11-14; G. Biffle 15-18; J. Logano 19-24; G. Biffle 25; M. Kenseth 26-41; J. Logano 42; B. Labonte 43-44; J. Gordon 45; T. Labonte 46; K. Kahne 47; D. Earnhardt Jr. 48-49; J. Johnson 50-54; D. Earnhardt Jr. 55-57; M. Kenseth 58-68; J. Johnson 69-77; D. Earnhardt Jr. 78-80; Kurt Busch 81-82; J. Johnson 83-84; M. Kenseth 85; J. Johnson 86-93; C. Bowyer 94; J. Johnson 95-97; C. Bowyer 98; J. Johnson 99-101; D. Earnhardt Jr. 102-103; J. Johnson 104; D. Earnhardt Jr. 105; J. Johnson 106-110; R. Stenhouse Jr. # 111-113; J. Johnson 114-120; R. Stenhouse Jr. # 121; J. McMurray 122; C. Mears 123; J. Gordon 124-125; A. Almirola 126-127; D. Earnhardt Jr. 128-131; J. Johnson 132-135; D. Earnhardt Jr. 136-146; Kyle Busch 147; R. Stenhouse Jr. # 148; D. Earnhardt Jr. 149-160; R. Stenhouse Jr. # 161; Kurt Busch 162; D. Ragan 163; D. Blaney 164; Kyle Busch 165-170; C. Edwards 171; Kyle Busch 172-173; J. McMurray 174-188. Leaders Summary (Driver, Times Lead, Laps Led): J. Johnson 10 times for 47 laps; D. Earnhardt Jr. 8 times for 38 laps; M. Kenseth 4 times for 32 laps; J. McMurray 2 times for 16 laps; Kyle Busch 3 times for 9 laps; A. Almirola 3 times for 8 laps; J. Logano 2 times for 7 laps; R. Stenhouse Jr. # 4 times for 6 laps; G. Biffle 2 times for 5 laps; J. Burton 2 times for 4 laps; J. Gordon 2 times for 3 laps; Kurt Busch 2 times for 3 laps; C. Bowyer 2 times for 2 laps; B. Labonte 1 time for 2 laps; T. Labonte 1 time for 1 lap; D. Ragan 1 time for 1 lap; C. Edwards 1 time for 1 lap; K. Kahne 1 time for 1 lap; D. Blaney 1 time for 1 lap; C. Mears 1 time for 1 lap. Top 13 in Points: J. Johnson – 2,254; M. Kenseth – 2,250; Kyle Busch – 2,228; K. Harvick – 2,228; J. Gordon – 2,220; D. Earnhardt Jr. – 2,202; G. Biffle – 2,201; C. Bowyer – 2,197; Kurt Busch – 2,193; C. Edwards – 2,186; R. Newman – 2,182; J. Logano – 2,179; K. Kahne – 2,153.